Join Angelina Ballerina, Camembert Academy's shining star, as she finds her way in her new school, puts together her own show and tries to land a leading role in the Mouskinov Ballet. Angelina continues to blossom as a maturing young mouseling as she adjusts to her new teacher's style and learns the importance of being a patient big sister. Prepare to pirouette along with everyone’s favorite ballerina in these sparkling stories! 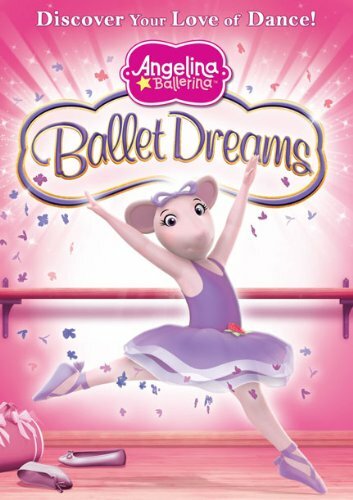 Angelina Ballerina Ballet Dreams will be available at most major retailers March 1st 2011, it’s available for pre-order at Amazon here: Angelina Ballerina Ballet Dreams. *Follow me @jamaise at Twitter & Tweet this : RT @jamaise #GIVEAWAY #WIN - Angelina Ballerina ~ Ballet Dreams DVD ~ http://bit.ly/hbWLrR Ends 3/20 tweet each day for one entry each ! Disclaimer: The publicist provided me with all information and product to review. I was under no obligation to review it if I so chose. Nor was I under any obligation to write a positive review or sponsor a product giveaway in return for the free product. We love Angelina at our house. She's pretty popular. My granddaughters love Anelina Ballerina. My daughter loves Angelina Ballerina! I am a follower! we love Angelina Ballerina books. I think the kids would really like the dvds too! my daughter loves Angelia Ballerina! I sent a friend request to Wishing Penny!! We're just starting to watch Angelina Ballerina. My daughter just turned 3 so I think she'll be more interested in it now. I follow through Google Friend Connect. I entered the Nellie's All Natural giveaway. I entered the Collegien Slipper Socks giveaway. I entered the Pretty Neat book giveaway. My 5yo daughter is in ballet and Loves Angelina Ballerina!